In conflict situations, peace settlements and cease-fire agreements may often, end violent conflicts, but do not prevent renewed violence or guarantee a permanent end to conflicts.5 According to the World Bank, chances that renewed conflicts will erupt are high and even higher when control over natural resources is at stake.6 In the past two decades alone, Africa has experienced violent conflicts with successive cease-fire agreements and peaceful settlements, which have often been followed by outbreaks of new conflicts. Countries in subSaharan Africa such as Burundi, Democratic Republic of Congo (DRC), Rwanda, Sudan, Republic of South Sudan, Somalia, Ethiopia, Liberia, and Uganda are some prominent examples. There are several dimensions of these kinds of conflicts and they vary from country to country. In certain circumstances, the fighting stopped after a cease-fire or peaceful settlement, but there was “no peace to keep” and soon conflicts resumed: Burundi and Liberia are good examples. The United Nations had to act as a de facto administration of these countries until after successful elections. Somalia is on an extreme example that has continued to experience conflicts, with the exception of “patchy” involvement of African Union Peace Keeping Missions, the International Community and highly limited engagement of Humanitarian Organizations as a result of the protracted insecurity. Recovery and reconstruction from violent conflict is always a daunting task, just like destruction caused by war. It always requires enormous amount of resources to address. Liberia is a good example. In the midst of reconstruction many times, hosting communities’ harbor localized tensions which continue to linger on in the form of interpersonal violence, inter–ethnic rivalries and renewed conflicts. Often the main targets and ultimate victims of this violence are the IDPs who were initially displaced by conflict, as it happened in Rwanda and Burundi. Sometimes, increasing crime rates in hosting communities lead to massive numbers of IDPs to migrate to urban centers for security reasons as has been seen in Uganda and Liberia. Countries emerging from conflicts do face numerous challenges related to post –conflict peace, reconstruction, resources allocation and livelihood opportunities (which are of critical concern) and addressing them correctly from the offset contributes to achieving sustainable peace.7 Securing access to land particularly, by individuals, hosting communities’ organizations, developers/investors and IDPs (access to land in areas of origin after protracted displacements) for various reasons often becomes problematic. 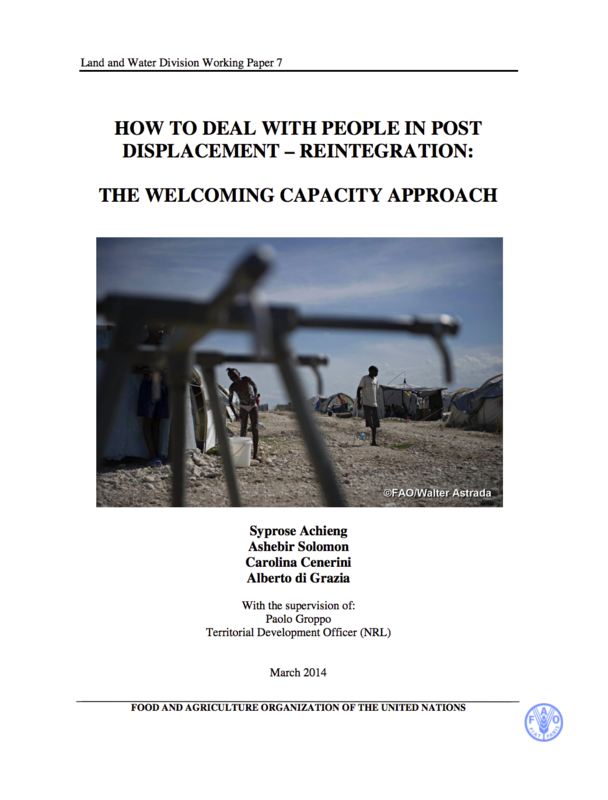 In some cases temporary access to land is required (for transit camps and public utilities), while in other cases, for instance involving relocation, more permanent arrangements are needed in cases of relocation. The importance of land rights in post-conflict resettlement is often not recognized early enough as an issue of concern to both IDPs and hosting communities. And even when it is recognized, it is often politically or practically (normally “top-down” and done on an “ad-hoc basis”) unfeasible to effectively address those issues in the immediate post -conflict period. Rwanda’s civil war saw Byumba, Butare and Ruhengeni Prefectures host up to 1 million IDPs as an immediate post-conflict resettlement. The hosting or local communities perceived the resettlement as an imposition or the arrival of “external foreigners imposed” on them by the Government. Such perceptions contribute to early agitation of localized tensions and “flare-ups” straining already scarce resources (natural resource conflicts driven by scarcity). IDPs reintegration8 in post conflict situations remains as a considerable challenge to governments, especially after the initial emergency Humanitarian Assistance ends. Competition over natural resources and land in particular, has been a critical cause of renewed violence, massive population movement and forcible displacements in post-conflict Uganda and Burundi, and an underlying factor in many others, like Darfur, Liberia and Democratic Republic of Congo (DRC), where in the last two decades the competition for access and control of natural resources have become a source of tension and conflict9 . In some post –conflict situations fresh conflicts are linked to competition over scarce resources, increase in population growth and decrease in productivity and/or either limited or no new opportunities to derive income from non- agricultural activities. Weak institutions or lack of capacity of national governments (i.e. effective governance at the local levels) also contribute to renewed conflicts, particularly in regard to resolving land claims and access to land after conflicts10. For instance, 22 years of war and conflicts in South Sudan, and 14 years in Liberia undermined the already meagre institutional capacity of the governments. During this time the institutions collapsed leaving no capacity whatsoever, to resolve the numerous conflicts raging over access and control of natural resources, land in particular.